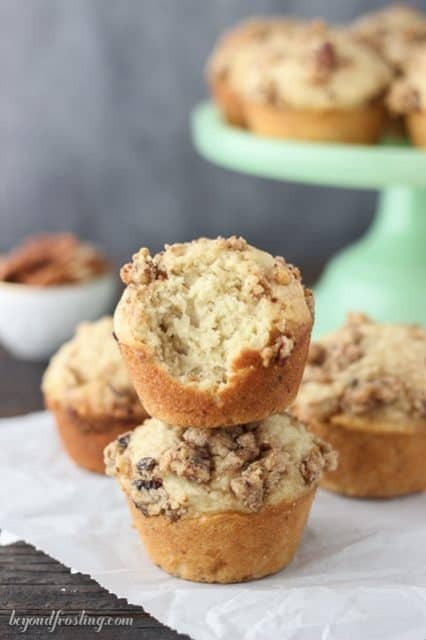 These Maple Pecan Banana Muffins are sweetened with maple syrup and topped with Sahale Snacks Maple Pecan Glazed Mix streusel. This post is sponsored by Sahale Snacks. All opinions are my own. Can you believe it’s Christmas week? I swear I blinked and the last thing I remember was sitting on the beach this past summer. This has been an awesome year filled with lots of fun, lots of work and lots of travel; which clearly was my favorite part. You might recall back in September that I spent some time at the Sahale Snacks headquarters. During my time with Sahale, I learned how they source the highest quality ingredients to create a variety of fruit and nut blends. I had a hard time choosing my favorite flavor, but I knew immediately that I would be a fan of the Maple Pecan Glazed Mix. That shouldn’t surprise you, because maple practically runs through my veins (hello, Vermonter over here). That’s why today’s recipe is so special. These Maple Pecan Banana Muffins will satisfy your breakfast cravings. You might also recall that I am a huge breakfast person. In my opinion, breakfast is acceptable all day long. This muffin mix is so easy, and it makes sky-high, bakery-style muffins. 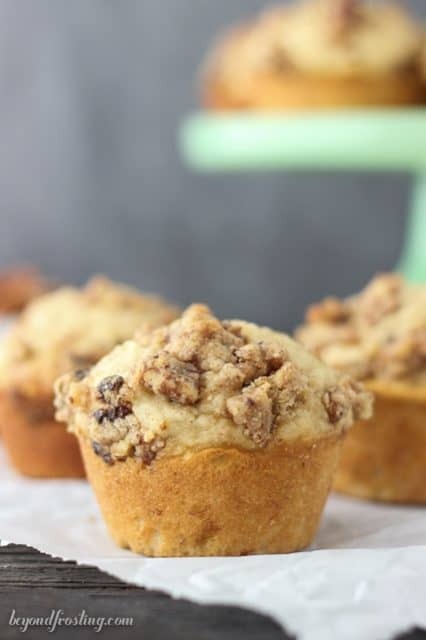 The muffins are blended with a combination of bananas and maple syrup and topped with streusel that is better than any other streusel I have ever made. I am claiming it on this one, and you all know how much I care about my streusels. Instead of my typical, brown sugar, flour and cinnamon streusel, I crushed up a handful of Sahale’s Maple Pecan Glazed Mixed and added it in. The addition of the glazed nuts, gives the streusel a flavor that cannot be achieved otherwise. 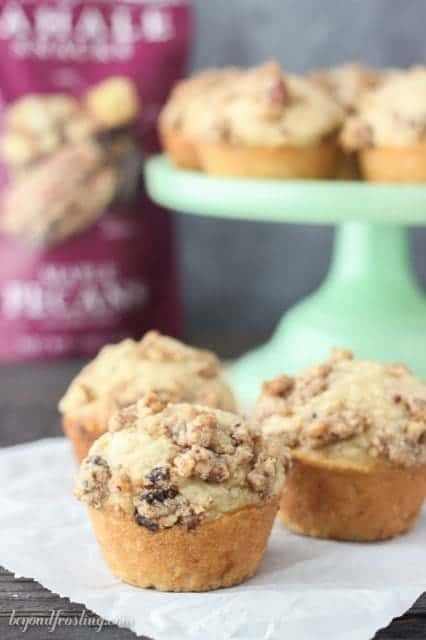 I pulsed the nuts in a food processor just a couple times, so there was still large chunks of nuts and fruit in the streusel and then I sprinkled it over the muffins before I popped them in it oven. The thing about my muffins is they are big. I fill my muffin pans right to the top and then I bake them at a higher temperature for a short amount of time, which helps activate the baking powder to make them rise nice and high. This is a trick I learned from a fellow food blogger that I adore. Then, just turn down your oven (but don’t open the door) and finish the baking at the lower temperature. You might notice these muffins have a nice dome on top! Just be sure to generously grease your pan because you will not be using baking liners. The most important thing about your batter is that the eggs and butter are well blended into the batter. I always mix my muffin batter with a wooden spoon, I don’t know why, but I recall my mom always telling me to do this. If you use an open whisk, the batter will clump together and be difficult to mix. You also need to be careful not to over mix the muffin batter. You will want to mix until the flour is incorporated, but not any longer! Whenever I have muffins in the house, they don’t last long. These muffins are no exception. Be sure not to skip out on the streusel! If you want to know where you can find Sahale Snacks, check out their store locator. This post is sponsored by Sahale Snacks. All opinions are my own. I have received compensation and product for this post. I would not be sharing this if it was not a product that I love. 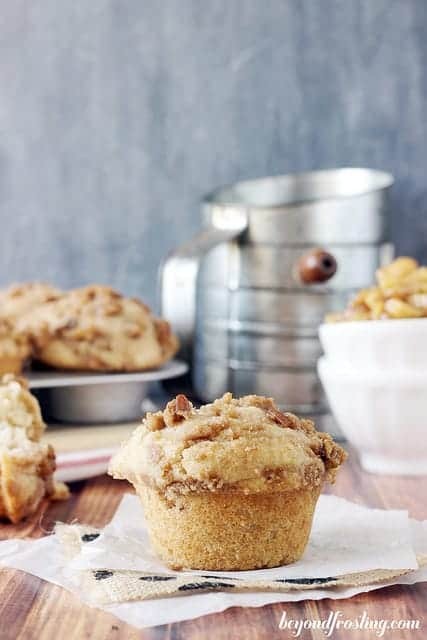 These Maple Pecan Banana Muffins are sweetened maple syrup and topped with Sahale Snacks Maple Pecan Glazed Mix streusel. Preheat oven to 425° F. Grease a muffin pan with Crisco or baking spray. In a medium-sized bowl, mix flour, sugar, baking powder and salt. Then set this mixture aside. In a separate bowl, beat the egg using a whisk until light and fluffy. Add melted butter and whisk together with the egg. Continue to add milk, vanilla extract, mashed bananas and maple syrup. Whisk everything together until smooth. Slowly pour wet ingredients into the dry ingredients and use a wooden spoon to mix just until combined. Prepare the streusel. Use a food processor to pulse the Sahale mix into smaller pieces; it will be crumbles with a few large pieces left. Combine Sahale mix and flour in a microwave-safe bowl. Add butter on top and microwave for 30 seconds. Remove from microwave and use a knife and fork to cut the butter into the dry ingredients. You should end up with a clumpy topping. Fill your muffin tin all the way to the top with batter, dividing between all 12 muffin cups. Sprinkle streusel on top. Bake for 5 minutes at 425° F and then reduce heat to 350° F and bake for another 16-20 minutes. Do not open the oven for at least 15 minutes; you will see how nicely the muffins rise. Baking times will vary by oven. Check your muffins for doneness by inserting a toothpick into the center of the muffin. If your toothpick comes out clean, your muffin is done. Allow muffins to cool completely in the pan. You can also cool on a wire rack, but you want to allow them to cool enough to remove and transport them out of the pan. They look fabulous Julianne! What great flavors to combine. Wishing you and yours a blessed New Year! 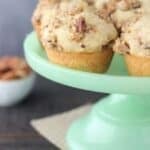 These sound so good – I bet the pecans give them a great little something extra. I’m a huge fan of Sahale snacks… they have the most interesting mixes! These look so amazing! Send me a batch?? They look so moist and delicious. And seriously, breakfast all day long needs to be a thing! 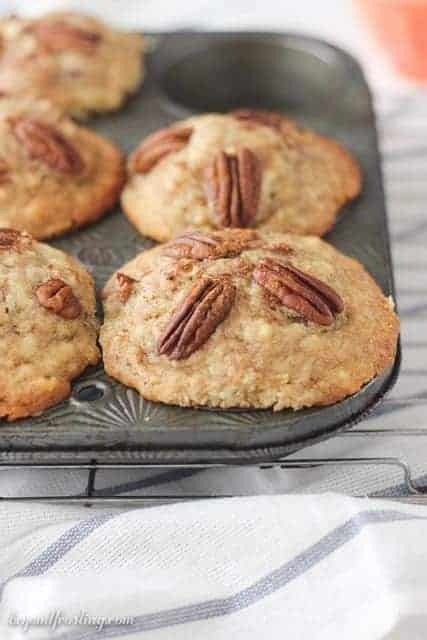 That maple pecan mix sounds wonderful – and the perfect topping for these muffins!! Bananas and muffins are my favorite! I just love the addition of maple to this. 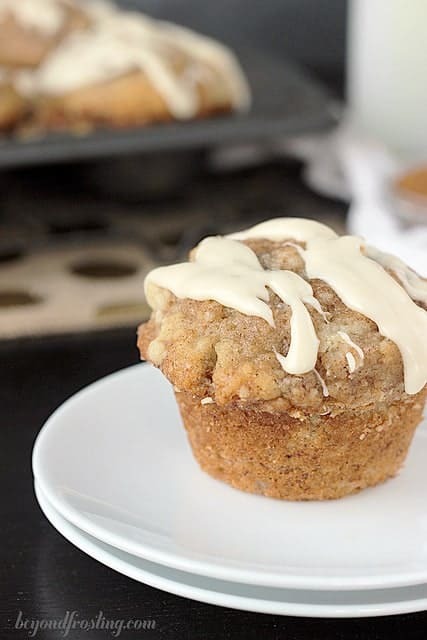 Ok this is ridiculous but banana muffins are one of my all time favorites. I know they are simple, but I just can’t get enough! Loving this maple pecan version! I love muffins with some crunch on top! 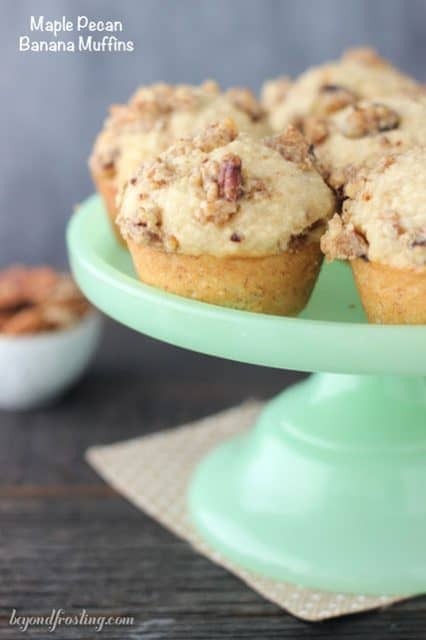 What a great way to use the Sahale maple pecan mix!